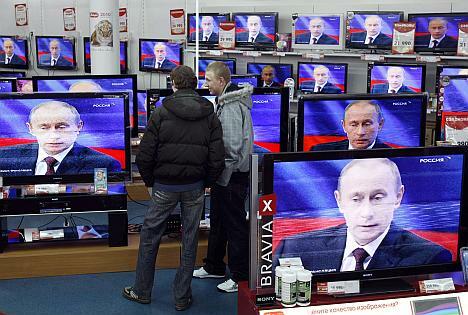 Is there any hope for Medvedev’s plan to create public television? Russia’s recent parliamentary and presidential elections, and especially the massive protests that followed, highlighted the need for public television in the country. These events in particular showed that the government-controlled channels fell short of the middle class’ growing demands for information. At best, they can offer plain propaganda made according to Soviet templates. At worst, it’s unprofessional propaganda. The pro-Kremlin media do not cover embarrassing events, such as scandals over vote-rigging at polling stations. The flip side of the coin is that independent media, such as the Dozhd (Rain) channel, try to report on all events, but because of their limited resources they often have no chance to do due diligence on their coverage, which results in frequent mistakes appearing on air. Now, however, it seems that the opposition’s demands for objectivity have not fallen on deaf ears. President Dmitry Medvedev has signed a decree to create public television in Russia, set a timeline for its creation and outlined the plan for the new media outlet’s work. But the opposition was, if anything, even more enraged by this act, and their complaints may be justified. Public television will be public in name only. The director general and chief editor of the channel will be appointed by the president, as will the members of the supervisory board; the project will be financed by the state treasury and will use the facilities of the Defense Ministry’s channel, Zvezda (Star). The opposition’s discontent with the proposed idea is shared by many television professionals. They point out that many provisions in the projects are very vaguely worded. One example is the issue of revenues. Mikhail Fedotov, chairman of the Presidential Council for Civil Society Development and Human Rights, believes that the fee for watching TV should be voluntary and run about 46 rubles ($1.50) a month per household. Clearly, the proceeds will be paltry, not even enough to pay for a channel’s basic day-to-day needs. Of course, there are channels in the world that charge still less, for example, America’s C-SPAN charges 6 cents. But it does not claim to present varied content, just round–the-clock broadcasts of sessions of Congress. Obviously, such broadcasting does not cost much. This view is echoed by Duma Deputy Dmitry Gudkov, but at the same time, he offers a way out. In his opinion, potential viewers should split the cost of creating TV programs on the Internet after deciding what exactly they would like to see. But Russian bloggers have challenged this view, saying that if people get all their information from the Internet, they do not need television. Skepticism over the public television project is reminiscent of the reaction to another controversial project of Medvedev’s presidency, the Skolkovo Foundation. In some ways it is the same story: the state tries to create an organization that will eventually be self-sufficient, attract investments and most importantly have resonance and bring about a shift in Russian mentality. Skolkovo is intended to revive Russian science, which barely survived the collapse of the Soviet Union. Likewise, public television is designed to revive the consciousness of Russians, undermined by decades of propaganda, to encourage critical thinking and an ability to filter information. The foundation has been moderately successful. Only time will tell if public television will fare as well. In fairness, it should be said that Russia once had a channel called Public Russian Television, or ORT in Russian. It was established by a decree signed by President Boris Yeltsin in 1994. Following the murder of its director general and resulting internal turmoil, it became Channel One and it is hard to imagine a more overt government propaganda channel. Will the new project manage to create a completely new format or will it become another on the long roster of boring and officious state-run media outlets? We will have to wait until Jan. 1 to find out.